I have been warned by many folks that this is something you'd only want to do once - but I loved it..
We had a 4 berth 'coupe' and it's pot luck who you get as company. I was certain the train went through Ukraine north of Rostov and it DOES ?! The couple sharing with us were from Krasnodar - we had two guys from Sochi to there. Yuri bought Kolbasa -we were looking for beer... but there wasn't any on board to be bought..
We were not allowed off the train - just to buy stuff. As we pulled off, I started taking video out of the window. 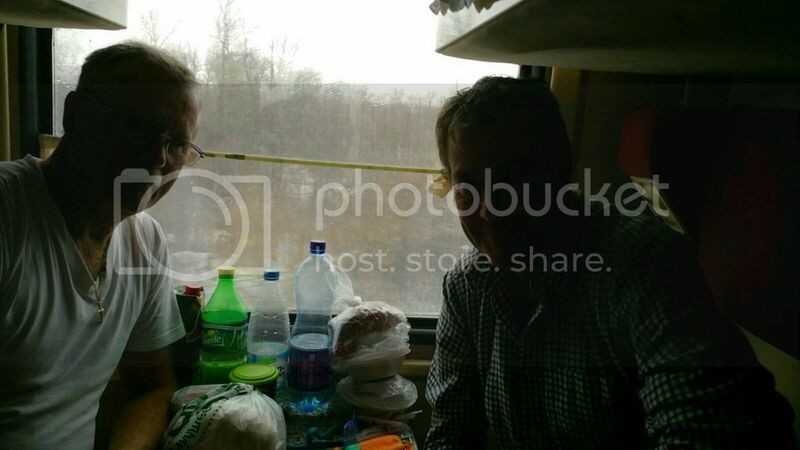 ..thinking the road was in Ukraine..not realising the TRAIN was going in and out of Ukraine. This region is clearly under Kyiv control and the bus stops were painted blue and yellow. I thought it bizarre that the line went so far into Ukraine. In the light of the situation, further south - It all seemed surreal. Who maintains the railway - when in Ukraine ? I'm guessing this is one area where it is important-for now - keep good relations. The best news ? As I stopped filming the desolate lightly snow covered region..A seller who boarded the train at Chertkovo, had beers for sale - Baltika 7 and we enjoyed a good lunch.